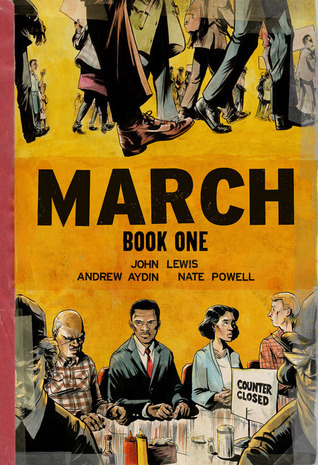 March is a difficult but worthwhile graphic novel story of the Civil Rights struggles in the 1950s America, as seen through the eyes of John Robert Lewis. Lewis is serving in the House of Representatives but he was front and center during the Marches, working with Martin Luther King and others of that turbulent mid century era. The book follows Lewis’ upbringing – laying it all bare and bringing the reader into his story and struggles. Although it starts with a landmark moment – the inauguration of President Barack Obama in 2009, it then transitions back to a segregated Alabama,the beginnings of the Nashville Student movement,and the bitter struggle for desegregation on the steps of City Hall. The book is honest, graphic (language and violence) but also very honest. The horrifying reality of being non-white in the South is visually illustrated in both terrifying and inspiring ways. One can’t help but respect all that Lewis has done in his life to bring equality to everyone in America. This story works particularly well in the graphic format since really, we’re dealing with an issue of appearance: the color of your skin. Though brutal at times, this is a very well illustrated book by NY times artist Nate Powell that ends far too soon. What affected me the most was that Lewis was always about peaceful change – and that through those peaceful but consistent and dedicated efforts, he and his colleagues were able to affect American society and finally end a terrible and brutal history. It’s a book I will hold for my daughter so that we never forget this history – lest we repeat it in the future with any person, regardless of race, religion, or color. This entry was posted in Book Reviews, Historical, non fiction. Bookmark the permalink.